Yesterday was Canada day, the day where eating chicken wings, drinking beer, and lighting up fireworks were not only allowed, but its mandatory. To celebrate this joyful day and to demonstrate that I am a spirited team player, I too, would like to participate in this unhealthy diet party. The thing is, I was not prepared for it. I was supposed to fast since it is Ramadhan after all, so my fridge was pretty empty apart from a bowl of rice, left over from my early breakfast (sahur). And since it was a statutory holiday, shops were closed. The only thing that opens was the 24 hours gas pump convenience stores, like the one near my corner. You see, that place is only good for three things: overpriced milk, 101 varieties of chips, and cheap alcohol. Perhaps according to their logic, people need milk for their breakfast, bags of chips to survive the day, and a bottle of alcohol before bed. I am not proud of this, but I kinda approve this logic. I was oozing disappointment here, ladies and gentlemen. Exactly on the day when junk food binge was celebrated, I was left out. It was the culmination of my unreliableness. I went through my (half empty) kitchen, looking for something to whip into an unhealthy snack to compensate. I found a bag of shelled pistachio, a sachet of flan with due date in a month, a jug of milk, and a half eaten chocolate bar. Unforgivable. 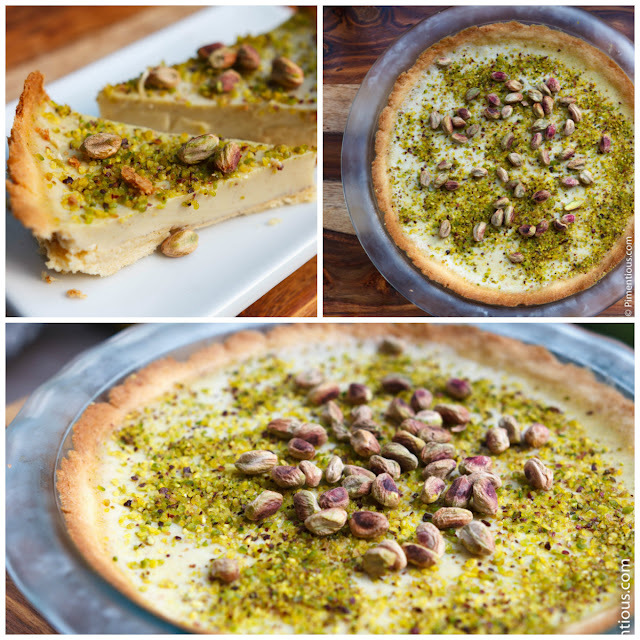 So I proceeded the day cooking another good but easy recipe using pistachio for dessert. Pistachio is definitely my favorite nut. Its has distinctive flavor and texture, and also it has so many health benefit. Do you know that this nut actually can improve erectile dysfunction? Truly nut for the nuts. Actually any pie crust recipe will do, even the store bought one. The flaky one or the rather crumbly one, free to choose as you like. Once the pie filling is set and completely cool, gently slice it into slivers and serve it with a cup of hot tea.